*This is a paid collaborative post. Please see my disclosure policy for details. Our recent trip to Florida spanned just 7 days and we packed as much fun into our holiday as possible. Our days were jam-packed and we certainly enjoyed lots of thrills and excitement. After lots of research before our holiday, I knew we were going to have an amazing trip but one thing I just did not expect from a holiday to the theme park capital of the world was there would be so many relaxing moments. However, across the week I experienced multiple moments of relaxation and at times, I was certainly able to completely switch off from the world. There are in fact multiple ways to relax at the SeaWorld Parks and today I’m sharing a couple of my most relaxing moments from our break. We visited Florida at the end of August. Most American children have gone back to school at this time of year and the weather is hot and humid. Prior to our trip I pictured packed theme parks, long queues and lots of hot and sweaty bodies. Honestly, this wasn’t the case at all. The SeaWorld Parks are designed so there is plenty of shade and there are complimentary water points dotted about to keep you hydrated. We watched a couple of shows at SeaWorld (Dolphin Days was our favourite) and were able to sit out of the direct sun and just relax - I 100% expected to be sitting out in the blistering heat during show times and was pleasantly surprised to find some shade. A couple of the theme park shows are indoors with comfortable seating and air conditioning too. Our favourite show from our trip was ‘Turn It Up’ at Busch Gardens - a fabulous indoor ice show with professional skaters. We watched the final performance of the day and found this to be a perfect way to relax and reflect on our day before leaving the park. I’d definitely recommend planning your day around show timings as these are a really nice way to rest and relax as well as escape the sunshine. The parks we visited were super spacious, spotlessly clean and filled with beautiful plants and flowers. Again, not the concrete and metal-filled jungle I expected. One special memory from the trip is us all sitting down by some pretty flowers and sharing a couple of frozen lemonades from pineapples at Busch Gardens in the sunshine. Bliss! There was certainly no rushing around at the theme parks and there was plenty of time for us to take things at our own pace. Discovery Cove is like nowhere else in Orlando. Spending a day at this all-inclusive resort has to be the ultimate way to relax. First of all, food and drink is included with admission which takes away the stress of budgeting or planning for meals. I loved being able to help myself to a frozen cherry Fanta or order a beer and relax on a sun lounger in the beach area and the kids couldn’t get enough of the freshly baked pretzels and snacks you could help yourself to. 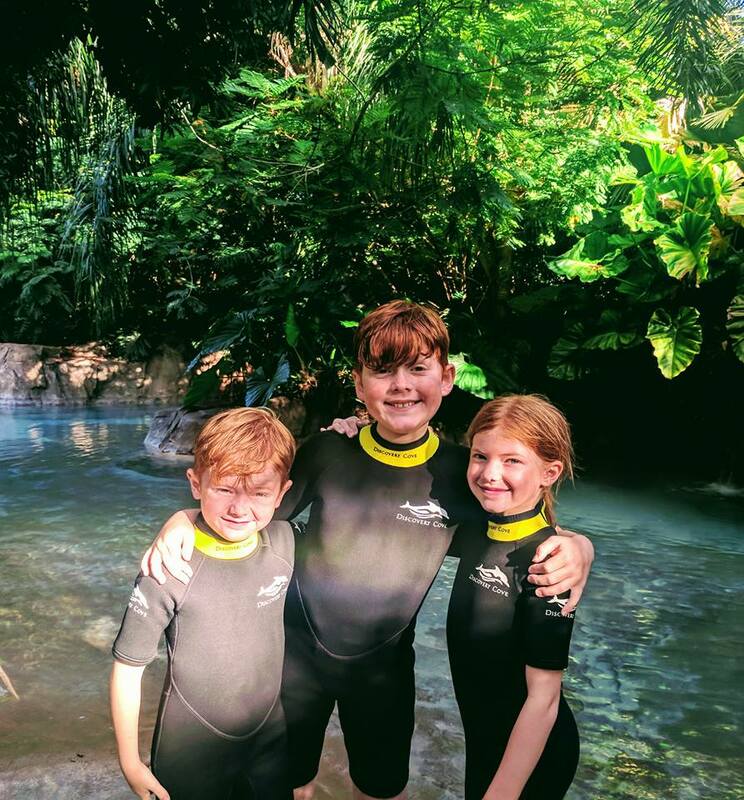 Our whole day at Discovery Cove was set to a relaxed pace and we really enjoyed floating around Wind-Away river and snorkelling with tropical fish and rays at our leisure. We hired a Cabana which really enhanced our stay and I’d recommend doing this if you’d like some extra privacy. Our Cabana included our own mini fridge which was re-stocked with drinks throughout the day, a personal locker, comfortable sun loungers, seating and the piece de resistance - our own personal hammock. 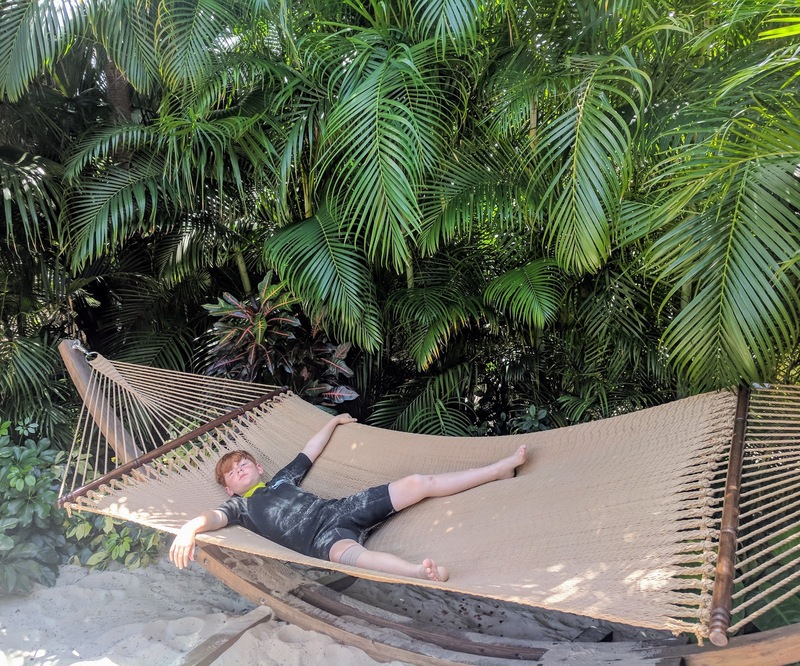 If I could have smuggled this hammock back in my suitcase I would have - sooooo comfortable! If you don’t splash out then don’t worry as there are plenty of sun loungers dotted around the North Beach and Serenity Bay areas. Discovery Cove is such a beautiful resort. You’ll walk past stunning waterfalls, swim through magical caves and marvel at the tropical birds flying above. The waters are crystal clear and because numbers are strictly limited, it’s never too busy or overcrowded. We especially enjoyed the special Sunken Terrace area within Freshwater Oasis where you can enjoy a drink sitting in the in-water chairs after you’ve visited the otters and marmoset monkeys. 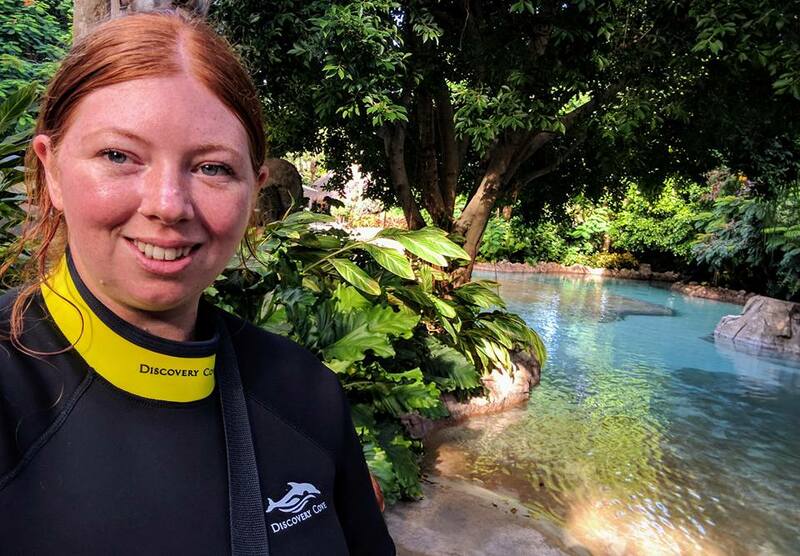 Spending a day at Discovery Cove really feels as if you are on some sort of tropical island and it’s easy to forget you’re in the heart of Orlando. Aquatica is the park in Florida that we felt really had it all. This water park has the biggest thrills (I’ll never forget free falling after the floor disappears as part of Ihu’s Breakaway Falls), lots of options for families but also plenty of opportunities to relax too. Roa’s Rapids and Loggerhead Lane are two river rides that do all of the hard work for you. On Loggerhead Lane simply float around and relax in an inflatable ring as you drift past beautiful surroundings, an aquarium and even Commerson’s dolphins. I could easily spend the whole day just staying in this part of the park and did feel completely chilled. Harry, Heidi and Jack really enjoyed it too and continuously begged us to go around just ‘one last time’. For parents with older children, you’ll find that Aquatica is home to Orlando’s very own beach. There are certainly worse things in life than relaxing under a parasol with a good book to the sound of waves as your teens explore the slides at their leisure. There are smaller water play areas dotted about the park for younger children too and I loved just relaxing in the shallow pool as I watched Harry, Heidi and Jack spend some time enjoying the smaller slides (which they loved by the way). We stayed at the Renaissance at SeaWorld which is perfectly located to explore SeaWorld, Discovery Cove and Aquatica as they’re all pretty much on your doorstep (less drive time also equals a more relaxing holiday in my experience). We found this hotel to be perfect for families, especially as the hotel pool was open until midnight every evening. The hotel also has it’s own spa where I sneakily escaped to on a couple of occasions to enjoy a couple of treatments. I highly recommend the spa’s steam room or one of the hotel’s outdoor spa pools if you’re suffering from aching limbs. Children are allowed in the spa pools as long as they’re supervised and it was lovely all being able to relax together after a day on our feet. Would I recommend Florida to families looking for a relaxing holiday? Before our trip there is no way I’d have even suggested a trip but after experiencing some of what Florida has to offer for myself, I certainly wouldn’t discount it. From relaxing in hammocks and watching beautiful sunsets together to floating around lazy rivers, experiencing first class service and enjoying professional shows, there’s certainly a lot more to Florida than rollercoasters. Wow who knew that Florida could be so relaxing! It's good to know cos with a holiday like that I think it's important to have a bit of chill out time - no one wants to return from holiday feeling more tired than when they arrived! Love the photographs, that last one of Heidi is awesome!